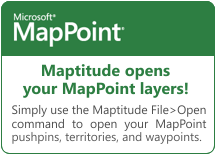 With the discontinuation of MapPoint®, Maptitude now dominates the desktop space vacated by Microsoft. Maptitude is a widely-used and fully featured mapping application targeted at business users in every global market and is the best MapPoint replacement. MapPoint provided outdated data. Don't use old data for new location-based decisions. Upgrade to Maptitude to use the latest features, Census numbers, and demographics. √ Maptitude is updated annually. The last version of MapPoint was MapPoint 2013. Stop using old data and start using Maptitude! Why Coverpoint chose Maptitude as the alternative to MapPoint. “Maptitude has an incredible number of potential applications. My company purchased it as a major upgrade to the discontinued Microsoft MapPoint. After discovering how much easier it is to accomplish what I did in MapPoint using Maptitude, I am discovering uses for it that were not considered during the time of purchase. I am only scratching the surface of Maptitude's potential applications, and their support team has been incredibly helpful along the way. “I was looking for a replacement to MapPoint, I found it, and it is many times better than the defunct MapPoint. The customer service is great too at Maptitude.